Alison Stevenson, head of learning resources provides a little more information on the recent archival acquisition of ‘Fake Ophelia’ by Steven Campbell, and where you can find out further information about this work. One of “the most remarkable” of Steven Campbell’s collages is how the critic Duncan MacMillan describes “Fake Ophelia” which became part of the GSA’s collections last year thanks to a generous donation (see A New Acquisition, Artwork by Steven Campbell for more information). The purchase of a new copy for the GSA Library of Duncan MacMillan’s 1993 book on Steven Campbell’s paintings prompted us to look again at what MacMillan says about “Fake Ophelia” which now hangs at the entrance to the Library. 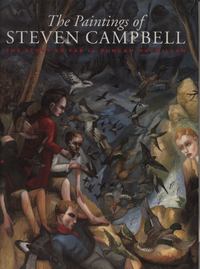 You can see for yourself by visiting the Library, and GSA staff and students can read more in “The Paintings of Steven Campbell: the Story So Far”.